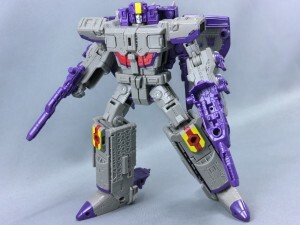 Thanks to fellow Seibertronian chuckdawg1999, we have a video review of the latest release in the Takara Tomy Legends line, featuring the Headmaster-ed version of Decepticon triple-changer LG40 Astrotrain - in his darker colour schemes compared to Hasbro's Titans Return voyager (which can you check again in our galleries here). Take a look at the video below, and let us know what you think in the Energon Pub! Legends Astrotrain is basically the Astrotrain we've been waiting for in the Titans Return line, if you've been waiting for a G1 colored figure. I'm really impressed with how they picked out the details on Astrotrains face, I almost thought it was a new mold. If you haven't been able to find Astrotrain yet, the Takara Legends version is a solid purchase. Hey woah woah, wtf? has anyone else gotten this message regarding their legends Lio Convoy order? Has he actually been released this month or no? Now I just need to wait until TFSource gets this guy (Astrotrain) in stock. william-james88 wrote: Hey woah woah, wtf? has anyone else gotten this message regarding their legends Lio Convoy order? Weird! My order is through amiami. I haven't received any correspondence from them. I feel like I heard the 17th was his release date. Well, I hope it comes sooner than later for you guys. The Resistance needs its leader. Wolfman Jake wrote: Now I just need to wait until TFSource gets this guy (Astrotrain) in stock. Amazon Japan has it in stock now and they'll ship to the US. Total cost was roughly 0.09 less than BBTS before shipping. Ordered on a Saturday, got it on a Tuesday. 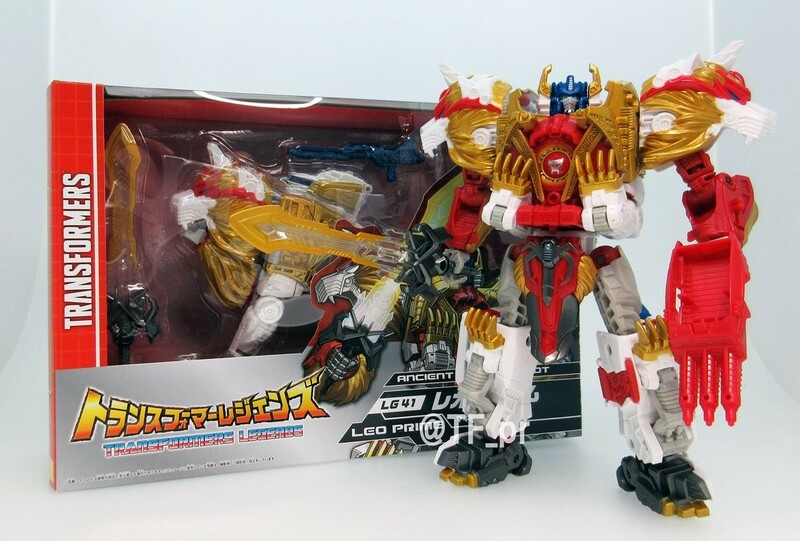 Also Amazon Japan says they'll have Lio Convoy on the 25th. I've already got Astrotrain preordered at TFSource, and will be converting some of my saved up Source Points for money off. Right now, it'll pay to be patient, but if (when) the US economy tanks again, Amazon Japan may become a viable option going forward. Silly question regarding Legends Astrotrain: how are his joints compared to either TR Astrotrain and Sentinel Prime? The TR one I've read has some minor joint issues, especially in the legs. I haven't heard anything on Lio either, but I'm also amiami. I'd be all over these, but the prices are prohibitive. Astrotrain looks awesome! The painted details like the windows seriously put him up a notch. There is kind of mini-scale of themselves for things like CW leaders and Titan Leaders. Soundwave is really only that big to allow for his gimmick to work. I'm looking forward to the downscaled MP Soundwave KO sometime this year (if it happens) but there is always the WFC/FOC Voyager I guess. But it's odd that there isn't very many Soundwaves that are Voyager size that are actually some sort of G1 related Soundwave. There are a few Deluxe size ones like the Device label one or the WFC Deluxe. (And yes I count WFC/FOC as more G1 related than I do perpetuate the pretty Fantasy that the is such a thing as the aligned continuity still. 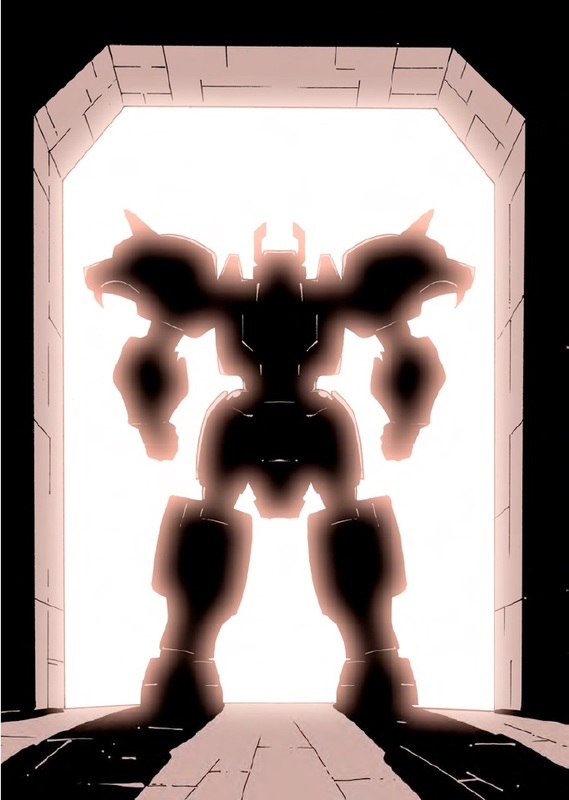 Mostly as it's completely ridiculous to say FOC is a prequel to Transformers Prime). Indeed, I understand why Soundwave and Blaster are the size they are. I also used their FoC Voyager versions as their "Classics" selves for quite a long time, but they just don't fit very well aesthetically compared to their '84/'85 compatriots, who are all (mostly) real world based vehicles and objects. The much more Cybertronian alt modes for the FoC bunch mesh a little better with some of the more whimsical/futuristic designs from '86 and onwards, but those aren't really their intended "peers" as far as I'm concerned. I'd love for Hasbro/Takara to just do solid voyager Classics versions of not only Soundwave and Blaster, but Ironhide, Ratchet, Trailbreaker, and Hoist...and all the Seekers...and Shockwave. Is that so much to ask, lol? I think an update of Soundwave as a surveillance van and Blaster as an SVU/sound system on wheels would be fun and fitting for each character's personality. Wolfman Jake wrote: Indeed, I understand why Soundwave and Blaster are the size they are. I also used their FoC Voyager versions as their "Classics" selves for quite a long time, but they just don't fit very well aesthetically compared to their '84/'85 compatriots, who are all (mostly) real world based vehicles and objects. The much more Cybertronian alt modes for the FoC bunch mesh a little better with some of the more whimsical/futuristic designs from '86 and onwards, but those aren't really their intended "peers" as far as I'm concerned. I'd love for Hasbro/Takara to just do solid voyager Classics versions of not only Soundwave and Blaster, but Ironhide, Ratchet, Trailbreaker, and Hoist...and all the Seekers...and Shockwave. Is that so much to ask, lol? TFA did a van of SW. Not good. If it was the DonFig design on the other hand, it would have been awesome! 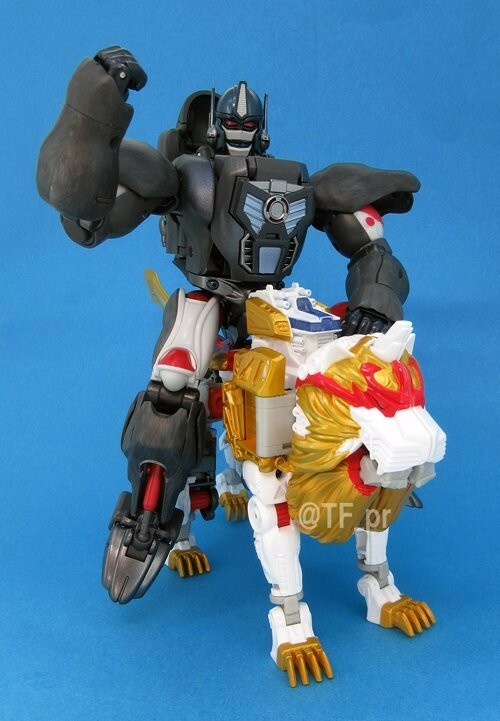 TF PR's twitter account has posted the first image we have of Transformers Legends LG 41 Lio Convoy in package. As with most Legends toys, he comes in his alt mode. He is scheduled for release at the end of this month, along with other Move the Best Figures. 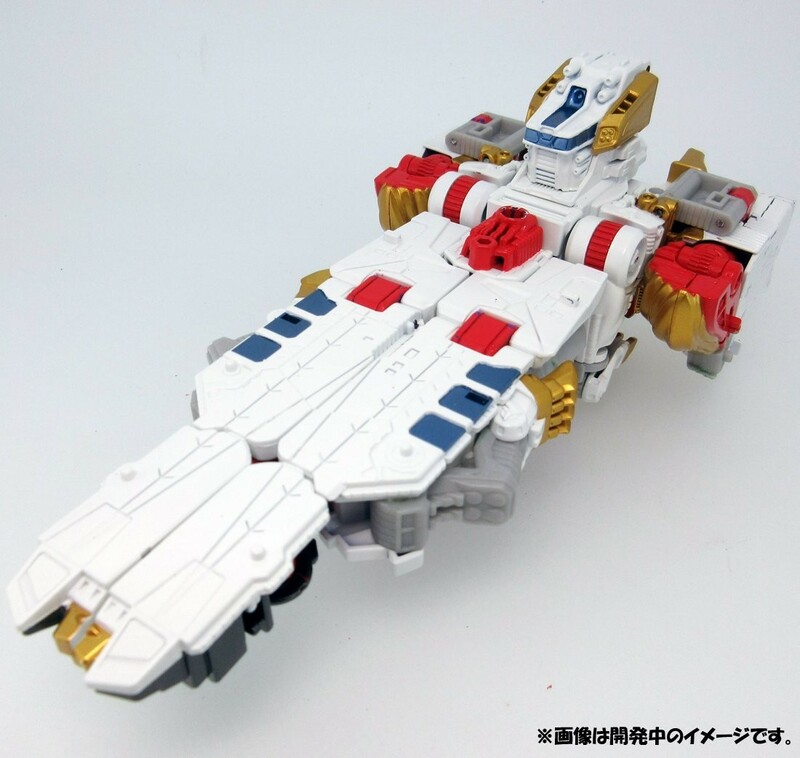 We also included a few other images below such as MP Primal on Lio Convoy, Lio Convoy with MP Starscream's cloak and an image of Lio Convoy's ship the Yukikaze for you to see the source of inspiration behind the spaceship mode ship mode. 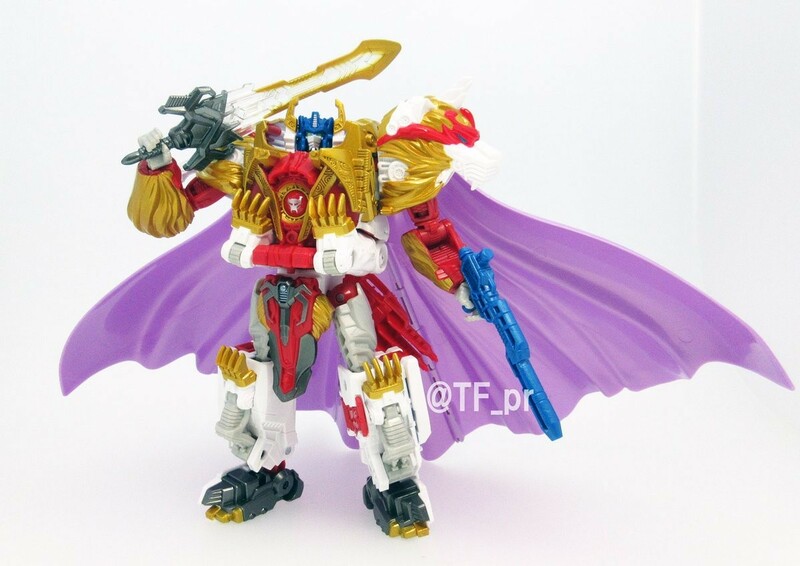 I like how they've done the head pylons; the colours used give the illusions that the gold parts are sticking out of the actual head rather than from sticks coming out of the neckbase. 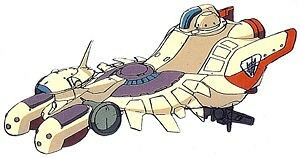 I am I the only failing to see the similarities with Leo's ship mode and the Yukikaze? The white is almost the same... but that's it. Is it supposed to be a reference to the ship?